The over all card size is 3.5x5 inches, more small inviation size than the traditional A2 I usually make. I was able to cut 3 card bases from 1 sheet of 12x12 cardstock. I used a Bella Stamp for the image, however I don't know the name of the stamp. I stamped the image on Georgia Pacific cardstock and then used a fiskars oval template I had to cut it. I colored the image with Stampin Up markers from the earth elements set. 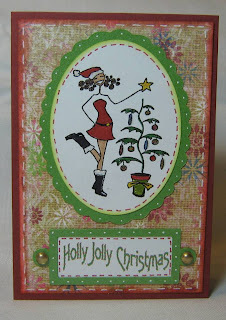 The mat cardstock is Fancy Pants, the name is Flurry and is from the Holly Jolly collection. I used a glitter pen on the ornaments, star and bow on the pot for the tree, then I added glossy accents on the ornaments. I used a Quickie glue pen on the fur of the hat and boots and then used white doodlebug sugar glitter to give it some blingy da bling *okie so loves blingy da bling*. If ya want to see the card better then just click the picture. The lime green color is Mica cardstock. OMG HAVE YOU TRIED IT?? IT IS SO PRETTY!! The cricut cuts it quite nicely, you just have to have max pressure and blade depth. Oh I used Alphalicious for the oval, of course I had to squish it so it would fit the oval I had my image on. The book plate with the Holly Jolly Christmas is from Fabulous Finds. The words Holly Jolly Christmas is computer generated with Microsoft Word and using the text art feature, the font is fletch. Oh did ya notice the little gold brads? Well they aren't brads.....HA HA HA I TRICKED YOU! *okie thinks she might have over medicated herself this evening* Oh well yes, back to the brads that aren't brads.....they are the Robin's Nest embellies, quite nice aren't they!! Okie! These turned out Fantastic!!! I love love love them! :)Plus your blogging always cracks me up! The stamp is Merry Bella - you may have enabled me, LMAO! Your Christmas party sounds like it's a lot of fun. Wish I could go! I love the invitation. Love the card!!! You did an awesome job, but then again you always do! Thanks for sharing!!! Thanks for the great comments guys!! Sandy when I upload the picture I set the preview as small, then the picture loads big but is smaller on here. I was able to do it from flickr before but now it just loads big from there, not sure why. So I have went back from uploading from my computer. That card is too darn cute!.. Dang it you do some pretty stuff!..